In Igneous Range, the vulture is the firebird, a symbol of ancient Iran, and a symbol of transcendence. For more discussion on this and other Jeffers poems, see Robinson Jeffers: Fire from Stone. A kind of Inhumanist tribute to California, from the giant Sequoias to “the one ocean.” A land whose grandeur inspires humility in this particular poet. A companion lyric to Cawdor and a splendid fire-poem in its own right, The Summit Redwood has never been selected for any anthology, possibly because it appears to put “people of color” in a bad light, or perhaps because its style appears to be inconsistent. I happen to see it as a marvelous portrait of kindred defiants: a red tree and a red man. I wrote most of Igneous Range before I had any idea I was writing a Jeffers novel, thematically anyway: violence, vultures, redwoods, defiance, and above all fire. A repeating theme is the dominance of the subconscious, and there is also a sense of insanity. Oh, and there’s genocide as well. There are lots of intelligent animals, but there is only one mad animal. Read more about this in Men Without Fear, available at Amazon. After missing a year of high school to a life-threatening illness, Fred Tarrant would need an extra year to earn his high school diploma. Not a great student to begin with, he found himself falling just short of the credits he needed to graduate. Unwilling to trade discrete favors with one of his teachers, he returned home in 1946, sans diploma, to Saratoga Springs to work at Tarrant Manufacturing. He started in the factory dip room, alone, hooking machine frames onto an electric lift and lowering them into huge vats of paint and thinner, afterward sliding each frame over a thirty-foot drip pan. He did this over and over while, unbeknownst to him, the lift threw sparks here and there, trying its best to set the place on fire. For many boys at the New York Institute, the man that made self-respect achievable was one Clyde L. Downs of Downsville, Maryland. When Clyde Downs first came to the Institute in 1929 at age 21, the Institute did not have a wrestling program, and Downs did not come as a wrestling coach. He appears to have been a general physical education coach, engaging students in a variety of activities. Overbrook School in Philadelphia has been credited with the first wrestling program for blind kids, started in 1929, the very same year that NYI hired Clyde Downs. The Institute would sometimes compete against Overbrook. The Philadelphia-based program was an all-white program, while the New York Institute was integrated. When the two teams met, the Institute’s non-white players were not able to participate, so the Institute was subjected to a handicap. But it seems that in the early years Overbrook had a genuinely superior program. A February 1937 story in Time Magazine describes a 22–5 beating handed to the Institute by Overbrook. By 1942, however, New York Institute students and graduates began to appear at or near the top of regional and national tournaments to a degree that Overbrook never had. When it came to John Jensen’s character, his failures could be as telling as his successes. Fred Tarrant recalls a night when his buddy John was heading out on a big date. Fred, though blind, could see better than John, so John had him inspect his outfit. Fred was impressed with John’s stunning white suit and red boutonnière, and sent John off into the New York night with his full approval. John returned later that night with his white suit splattered with grease, soil, and blood. He had fallen off a train platform en route to his date! Harry J. Sutcliffe was born in Brooklyn, New York on 10 August 1925. He was delivered premature and lost his sight soon thereafter to an incubator mishap. At the age of thirteen the young student became interested in amateur radio, and by the time he was sixteen was a confirmed “ham” operator. 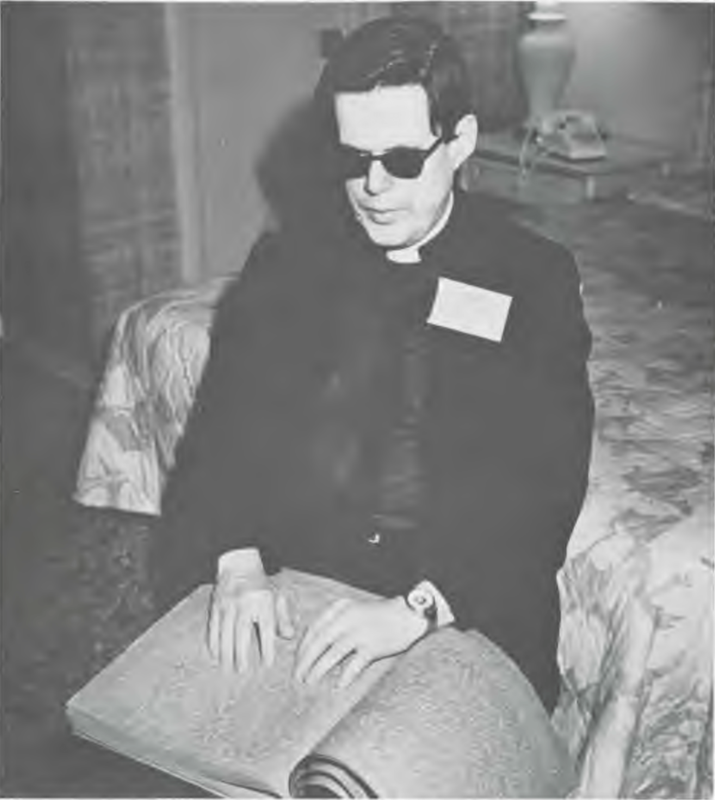 He did a great deal of reading of technical material on the subject and studied under the expert teaching of Bob Gunderson, well-known teacher of the blind. During World War II there were fifteen or twenty amateur radio operators at the school, who worked for the Radio Intelligence Division of the Federal Communications Commission, engaged in recording propaganda broadcasts. Young Sutcliffe also worked for the War Emergencies Radio Services of the Office of Civilian Defense of New York, covering telephone failures resulting from attack or other emergencies. For his participation in this important work he was awarded a citation by the late Fiorello LaGuardia, then Mayor of New York City. trembling in the California sun. all the wreckage tangled in a heap. sediments of eons, and mother’s clotted blood.